In this interview, Linda Eaton discusses her role as the textiles curator of Winterthur, the Delaware museum that was once the estate of Henry Francis du Pont and now showcases American antiques. The author of “Quilts in a Material World: Selections From the Winterthur Collection,” Eaton recently curated a traveling exhibition of Winterthur’s quilts. She can be reached via winterthur.org. I started at Winterthur in the summer of 1991 as the head of the textile conservation lab. I morphed over to the curatorial side of things at the very end of 1999, just over 10 years ago. It’s gone by in a flash. We have just about any type of textile that you can think of, including one of the world’s great collections of English and American printed textiles from the 18th and 19th centuries. We also have a very good collection of French textiles and a wonderful collection of quilts. Winterthur is also very strong in Oriental rugs and ingrain rugs, which are the flat-woven rugs that were popular and prevalent in America from the late 18th until the early 20th century. Textiles also encompasses needlework—our collection of American examples is pretty outstanding—and historic clothing. In that area, our holdings are small but interesting. And then, of course, we’ve got a whole house, 175 rooms, full of curtains and textile furnishings that were often made out of antique fabrics as part of the Colonial Revival period in the early 20th century. I’m interested in making connections between the so-called Colonial Revival and modernist movements. Collectors Weekly: Does Winterthur have permanent exhibitions or are they constantly changing? Eaton: We have two different ways of viewing various parts of the collection. Between 1929 and 1931, Henry Francis du Pont, who founded the museum, restyled, remodeled, and extended his family home to create what is now the museum, which is 175 rooms of fine and decorative arts. You can take tours to look at the way that these very wealthy collectors lived in the early 20th century, or you can come and see some of the icons of American furniture, needlework, and silver, those kinds of things. In the early ‘90s, when I first came here, they built the galleries building, and that’s where we have some of our semi-permanent galleries. I’ve got a textiles and needlework gallery. There’s one for prints and paintings, one for furniture, one for glass and ceramics, and another for metalwork. There’s also a gallery that shows the history of the styles in the late 17th, 18th, and early 19th centuries, which is the period of time that our collection is strongest in, and important related objects like craftsman’s tools. And then we have a changing exhibition program upstairs in our galleries building. So it’s a really broad range of stuff. Collectors Weekly: How did you acquire the collections at Winterthur? Eaton: Henry Francis du Pont, who founded the museum in 1951, donated the bulk of the collection. He moved out of the main building over to what we call the Cottage, which had only 64 rooms. The collection has continued to grow since the museum opened, both during du Pont’s lifetime and after, and we continue to collect today. He was a voracious collector, very obsessive. He collected a huge amount of stuff throughout his lifetime. Since his death in 1969 we’ve continued to build on that, although not at quite the same pace. We’ve also been very lucky. Since the museum opened, there have been many generous donors who have given us all types of really wonderful things. And then, like all museums, we have a very small acquisition budget, so we occasionally make purchases to add things to the collection that we feel we need or to fill a gap if something comes up for sale that we have to have. Collectors Weekly: Tell us a bit about the traveling quilt exhibit. Eaton: Right now it’s in Milwaukee, where it’s called “American Quilts: Selections from the Winterthur Collection.” The book and the version of the exhibition as it was here at Winterthur was called “Quilts in a Material World,” so it’s a little confusing. Next it’s going to the Virginia Museum of Art in Richmond, and I’m not quite sure what they’re going to call it. But anyway, it’s a selection of around 40 quilts, depending on how you count them, because beyond bed coverings, there are also a few other forms of quilts. Cotton appliqué counterpane quilt, maker unknown. United States, 1800-1825. Purchase with funds provided by Mr. Samuel Pettit in memory of his wife, Sally Pettit. For instance, we have a quilt and a coordinating set of valances, as well as a quilted dressing table cover, that were made in Rhode Island in 1815 by a woman named Mary Remington. It took her a year to make her quilt. We have a group of letters that she wrote to the man whom she eventually married—they read like a soap opera. These letters show very clearly that a young woman in the early American republic was actively involved in political discussions about global trade and American textile production. 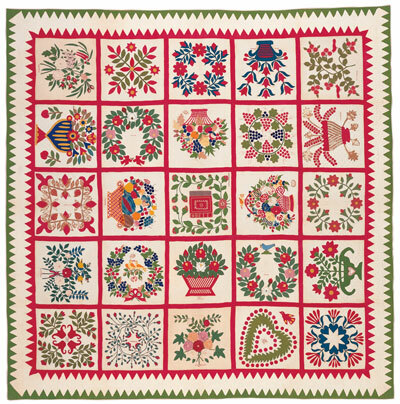 Her family invested in some of the earliest cotton-spinning mills in Rhode Island, and she was very involved in designing and making her quilts and other forms of needlework. I’ve selected other quilts under thematic topics that are often more anonymous than Mary’s—it’s very rare to have that level of personal information about one woman who made a quilt that long ago. Many of the quilts are earlier than the kinds you see more frequently in exhibitions. The earliest one is from the late 17th century. We’ve also got some very early 18th-century quilts, some really special things to see. The exhibit started here in 2007 before going to St. Louis. Then we brought it home and put it away. We just got it out again to send to Milwaukee, and then it goes off to the Virginia Museum of Fine Arts in Richmond, from October 2010 through January 2, 2011. After that it’ll come home and we’ll put it away for good. Collectors Weekly: Are all the quilts from du Pont’s collection? Eaton: Some of them are, but others are gifts to the museum. A few of them we’ve purchased with money that people have given us for quilts or other needlework. The collection focuses mainly on the 1700s through 1850s, but I’ve got something from the late 1600s in there, a beautiful yellow silk quilt. It was originally part of a small group of maybe 10 or 12 that we initially thought were made in India for the Western market. But by looking at the iconography and having the dye analyzed, we were able to show that the quilts were actually made somewhere in Europe, although we’re still not quite sure where. That’s why the title “American Quilts” is maybe just a bit misleading, but they all ended up in America. The majority of the ones that are in the show, though, were made and used in America. 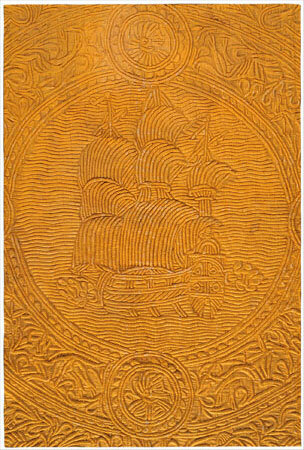 The yellow silk quilt is the earliest in the exhibition. It’s got a ship in the middle with cannons being fired. It’s subtle, but the more you look at it, the more you see. We speculate that it is one of a pair of quilts—early quilts were often made and sold in pairs. This is a professionally made quilt, not somebody’s home handiwork, and was really high end, very luxurious for the time. We think this quilt and the other one in the pair, which we believe survives in England, tell the story of great battles between the East and the West, between the Christian and the Muslim worlds. What’s more contemporary than that, right? So one of the things in the book and the show is that you can draw a lot of connections between the historical context of these things and the events of today. Collectors Weekly: Do you find modern connections in many of the quilts that you’ve researched? Eaton: Yes, I do, actually. We have a lot of preconceptions about what women’s lives were like in the past. One of the things that happened as I researched quilts and other people researched the history of women is that we realized we’ve maybe underestimated the women of earlier periods in many ways. They were very much like us. Collectors Weekly: What else have you learned? Eaton: Well, I’m one of these academic nerds, and so the thing that I got really excited about was discovering a group of quilts that were made from fabrics stamped with oil paint. That type of textile printing was prevalent in Europe before the 17th century and superceded once the beautiful Indian-printed textiles started coming into Europe in the late 16th and early 17th centuries. But I’ve found a group of quilts made using this stamping technique. The earliest one—it’s not in the book because it doesn’t belong to Winterthur—is from just before the American Revolution. Cotton pieced quilt, maker unknown. United States, 1790-1810. Bequest of Henry Francis du Pont. These stamped quilts were at the low end of the market. They were very easy to produce, and much cheaper, than the higher-end printed stuff. Here they were being made in America at a time when Americans were trying to get away from importing British goods, when people were protesting against the Stamp Act. That’s one of the things that I found most exciting about the research that I did for the book. But in the end, I guess I just wallow in the beauty of the quilts. They are really beautiful. I chose some that I knew people would understand and connect with, but others are the kinds of quilts that you don’t see as often, and they really are pretty amazing just as works of art. Some of them are exquisite. Collectors Weekly: What types of quilts are they? Eaton: They’re all types. Some of them are whole-cloth quilts made out of one type of fabric. Some of them are pieced; some of them are appliqué. People have this preconception about quilts, but there’s really such a diversity of stories and only part of that story has been told. I was trying to take a different angle on it and put it into a historical and cultural context so that you can appreciate them both as beautiful things on the wall and as works of art. The more you know about the background and the history of either the fabrics or the designs or the people or the context, the more it enriches your experience of these beautiful things. People don’t have to pay attention to the research and the writing about the quilts, but if they do, I hope that it enriches their experience. Collectors Weekly: Besides the quilt from the 16th century, what are some of the other older pieces in the exhibition? Eaton: There’s one that’s probably from the 1790s that has a printed square in the middle commemorating George Washington and other leaders of the American Revolution. It dates to somewhere between 1790 and about 1800. It’s just got the most interesting fabrics on it—it’s a really beautiful piece. That’s one of my big favorites. 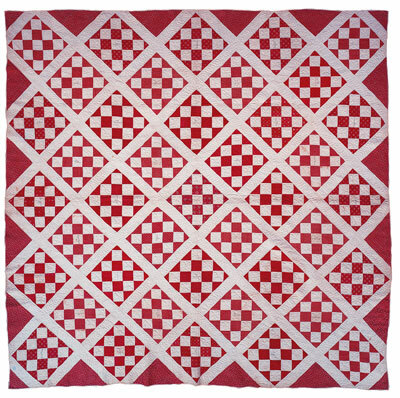 There’s another pieced, silk quilt that was made in about 1805 by a woman named Martha Agry Vaughn, who lived in Maine. That one is really beautiful. It has a myriad of different types of mainly silk fabrics, all these tiny pieces sewn together to make an overall whole. I can just sit and look at that thing forever. I have a number of whitework quilts. I’ve got this really great appliqué flowering tree that was made in imitation of these things called palampores that came in from India. They had these lovely trees with all different kinds of flowers on them—not realistic trees, but trees with scrolling branches. The earliest one is from the 1600s and the latest one is probably from the 1850s, but most of them date to the late 1700s and early 1800s. The golden age of quilting really started in the 1830s, and I do have a number of pieces from that period, but a number of the ones from the exhibition are earlier. Collectors Weekly: Why were the 1830s the beginning of the golden age? Eaton: I have a theory about that. What was happening in the 1820s and ‘30s is that women’s education was changing. Instead of doing fancy embroidery in school, they were starting to study more academic subjects. Until then, the way a woman would show her education had often been by making samplers and needlework pictures. But in the 1820s, ‘30s, that started changing. Women now displayed their skills through plain sewing, which includes hemming, seaming, and those techniques used to make pieced or appliqué quilts. I think that’s one of the reasons why quilting became more popular and prevalent at that time. Cotton wholecloth quilt, maker unknown. England or United States, 1780-1800. Also, the mechanization of fabric production was making cloth less expensive and more available. Therefore, a wider cross-section of people could afford to do this kind of work. More people had quilts and more people saved them. A lot of the earlier quilts were professionally made, so the whole idea of displaying your artistic and sewing skills in a public display of your work was changing in terms of needlework techniques. Collectors Weekly: What do you mean by professionally made quilts? Eaton: Professionally made quilts and quilted pieces have been made since the dawn of time. There was quilted clothing, all sorts of things. Professionally made quilts continue to be made today. Looking back, it’s hard to distinguish between people who were doing sewing as a means of earning a living and people who were sewing for their families or artistic pleasure in their leisure time. Just as both of those things happen today, those things happened in the past. There’s not just one linear story here. It’s very much more complicated. Sometimes we’re not sure whether we can always recognize the differences. 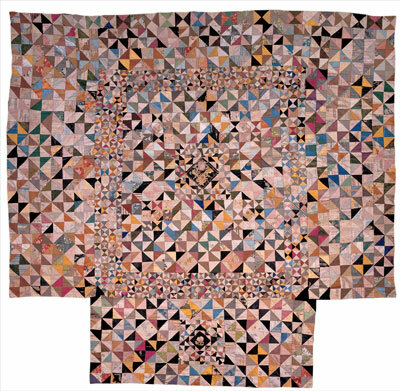 A lot of professionally made quilts were actually quilted petticoats, but women were also making quilted bed coverings. And the difference is really whether somebody’s paying you for it or whether you’re doing it for your own pleasure or your family. There’s really very little difference in the quality of a quilt other than that. Collectors Weekly: How many quilt makers are identified in the exhibition? Eaton: I haven’t counted. I do have a number of people who I have been able to identify, some of whom I know quite a lot about. In many cases, women’s public lives are not found in the sort of legal documents in the way that men’s are, so it’s sometimes difficult to find out about them. But I am lucky that I have found information about a number of the people who made the quilts in the exhibition. A lot of the quilts are in thematic sections that enabled me to interpret them because I’ve been able to find information about other similar or related kinds of quilts. So I’m interpreting both very personal and individualized characteristics, as well as more anonymous ones. Mary Remington is the main person. She made whitework quilts. I found an amazing amount of personal information about her in her letters. I knew that she was agonizing about whether she should marry this guy for years, and she even wondered whether he was marrying her for her money—and he was. I know all sorts of things about them. But then there’s a woman named Eliza Bennis, who was one of the leaders of the Methodist Church in Ireland before she moved to Philadelphia. Toward the end of her life, her husband died and she suffered financial reversals. She and her son came to Philadelphia, where she was much revered within the Methodist community. She brought a quilt that she had made in 1782 with her. It’s an amazing story. Cotton appliqué counterpane quilt, made by Eliza Bennis Waterford, Ireland, 1782. Bequest of Henry Francis du Pont. I’ve got Mary Keller from Maryland. She quilted the names of a lot of her relatives across the bottom of her quilt, which is just a wonderful, wonderful thing. I’ve got another quilt that’s got stenciled designs in it made by Mary Ann Hoyt from Reading, New York, but I wasn’t able to find out very much about her. And then I’ve got a number of quilts that were made by groups of women. One is a Baltimore album quilt made by a group of people who belonged to the Old Otterbein Church, one of the last German-speaking churches in Baltimore. I’ve been able to track people of German ancestry who had been in Baltimore for generations and others who were just recent immigrants. So that was kind of interesting to me. Sometimes I know a name, sometimes I know where they’re from, but a lot of them are more anonymous. Collectors Weekly: What are some of the major historical events that had an impact on quilt making during this era? Eaton: There’s a whole section in the exhibition on political quilts. 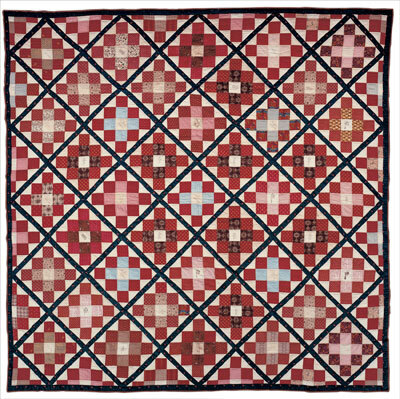 A lot of the quilts in the show were celebrating peace after the War of 1812 or the American Revolution. I’ve got a whole-cloth quilt that depicts a Benjamin West painting of a treaty-signing with the Indians. All of the quilts are influenced by the fashions and the feelings of their times. A lot of the designs are based on Neoclassical patterns for floors, because the top of a bed is like a floor. If you think of a four-poster bed with curtains and a top to it, the bed cover is the floor and the top is the ceiling. People don’t often connect the fact that block quilts in particular are influenced by architecture and its history, especially from the Neoclassical period. Collectors Weekly: What are the exhibition’s themes? Eaton: There’s a section on Mary Remington’s quilt that talks about all of the different events within her life. Another theme is the social connection between women and the role of quilting in their lives. Then there’s a section about the actual work of sewing; the teaching of sewing, the kinds of sewing and embroidery that were prevalent, that kind of thing. The exhibition also gets into early American textile production—I’ve got a group of quilts that relate to global trade. I get so tired of people talking about the global economy these days like it’s something new when, in fact, the textile world has been global for centuries. Silk, cotton, and linen pieced quilt made by Martha Agry Vaughn Hallowell of Maine, circa 1805. In my book, I also focus on how quilts were used in terms of interior design in the early 20th century, but that information is not in the traveling exhibition because it’s much more Winterthur focused. It’s particularly interesting to me, though, because quilts were really chic and were highly valued by early modernist artists and designers. For example, the couture designer Elsa Schiaparelli had quilted chintz furniture covers in her London and Paris apartments. People forget that quilting was also associated with modernism. Another misconception is to only associate quilting with poverty, the practice of piecing scraps together. In fact, the earliest quilts were highly luxurious items and owned by wealthy people. A lot of quilts were made with fabric that was bought specifically for that purpose. There were many quilts that were made by people who were not well off, but that story tends to be a later one, from the Depression and the 20th century. It’s not what was happening in the 18th or 17th centuries. 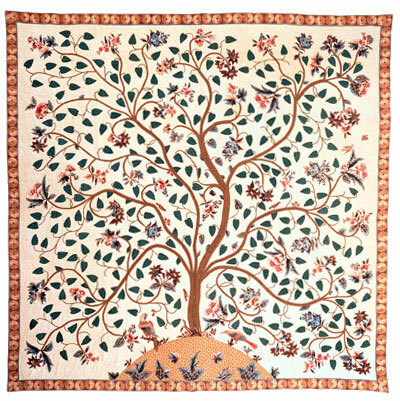 Quilts have also been aligned with so-called folk art. Depending on how you define that, it could mean art by people who are not traditionally educated or trained as artists. In fact, a lot of the women who made the early quilts were highly educated, as well as artistic. Collectors Weekly: What do the quilts in the exhibit tell us about social conditions? Eaton: A lot of them speak to the maker’s social status. For example, Mary Remington’s whitework quilt from 1815 has a quilted coat of arms in the center, the Remington family coat of arms. But America was a republic by that time. After the revolution, people were trying to figure out how to operate without the kind of class structure that they had under the monarchy. So the presence of that coat of arms on that quilt says a lot. She’s making it for her marriage bed. She’s an only child. Her last name is going to change yet she puts her name, Mary Remington, and the Remington coat of arms right in the center of the bed. That says a lot to me. 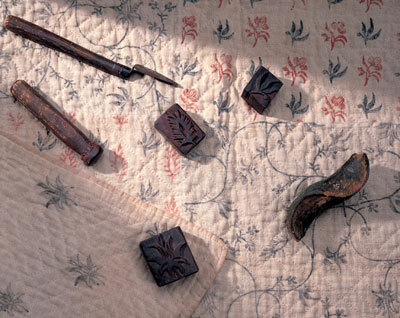 Collectors Weekly: What were some of the different reasons why people made quilts in the 1700s? Eaton: In the 1700s, people who were well off tended to make quilts. They were often intended as decorative accessories for the house. They usually featured the kind of needlework people could do when they were visiting or being visited. These were very public examples of needlework. Only wealthy people had quilts because of the cost of the fabric. Poor people tended to have blankets. Collectors Weekly: What types of materials were used? Eaton: Some of the really beautiful ones were made out of wool, and there are some gorgeous silk examples. Early on they could be made of anything—wool, silk, linen, cotton. Cotton was highly fashionable and very expensive until the processing was mechanized in the 19th century. So the height of chic was a white cotton quilt that people might think is very plain now. Think about how difficult it must have been, how much labor and time and effort would have been required, to keep a white quilt clean. This was way before washing machines—hopefully you could afford to pay somebody to do that. It’s amazing: we sometimes forget the labor that was involved in keeping these things clean. 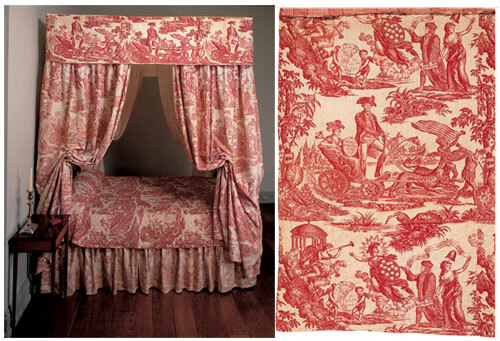 In the 1700s there was also a big boom in printed textiles, and so those were highly, highly fashionable. Printed cottons were chic, fashionable, and highly desired. That kind of stuff seems common to us now, but at that time it was new, relatively rare, and far more expensive. It was a different time. Collectors Weekly: Where did people get these new printed fabrics? Eaton: They would buy from merchants. In 18th-century America there was a big international trade in printed textiles, as well as a few people printing here by the end of the century. There was a whole network of international merchants, shippers, retailers, and wholesalers bringing in fabric from India, France, England, and the Netherlands. If you had trade connections in Britain, you would probably buy direct because that was cheaper—every time material went through an intermediary’s hands, the price went up as they took their profit—or you could buy at the local shops. Collectors Weekly: Where did the quilt makers in America find their influences? Eaton: Quilt designs were published in the mid-19th century, but people also got inspiration from design books, architecture books, fashion, and the things they saw around them. 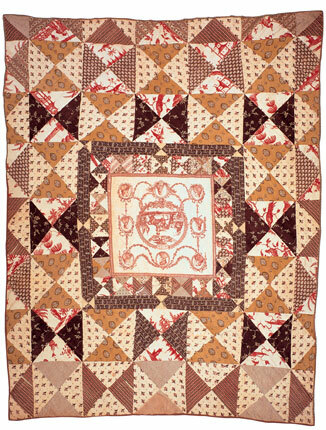 Cotton pieced quilt by Hannah Woolston Coles of Camden County, NJ, circa 1841. Gift of the family of Alice Blackwaln, great-granddaughter of Joseph Heulings and Hannah Woolston Coles. Since the 1970s, various states and regions in the country have been doing these quilt documentation projects. Because we can build on their work that’s been going on for decades now, we’re beginning to identify some regional characteristics for some of these quilts. For example, there’s a quilt called the friendship quilt. I’ve got two in the book and only one of them in the exhibition. The one in the exhibition has a lot of Turkey red fabrics, which is a particular type of color. Friendship quilts were made in other parts of the country, but the ones that were predominantly in this myriad of Turkey red fabrics seem to be particularly popular in the Mid-Atlantic region of the country. The standard regional design is the Baltimore album quilt. That became very, very fashionable in and around Baltimore. In the book, I have a wonderful whitework quilt with a quilted eagle and shield in the center of it. There were similar designs created in Harpersfield, New York. It could be that the same person drew these designs, or perhaps different women who were particularly artistic and skilled drew them. A professional artist may have produced the designs for women to quilt. If you’ve got one of these quilts with this particular style of eagle and shield and there are other specific design details, you can say for sure that it’s from the area of Harpersfield, New York. Collectors Weekly: What are some of your favorite quilts and stories? Eaton: We have a lot of pieced quilts with stars. There’s a starburst design by Rebecca Scattergood Savery that was very popular. I’ve got some quilts whose designs are made from wholecloth, others that are expressed in appliqué. At Winterthur, it’s the diversity that’s noteworthy. If you look at the fabrics, the way quilts were made, and who used them, that’s where you get your stories. One was made just like Mary Remington’s to celebrate a wedding. Another featured a palampore, a top fabric imported from India, which was then quilted in either London or America, probably by a professional quilter. The quilt still has the stamp of the United East India Company, which had the exclusive rights to import palampores into Britain. Because imported fabrics undercut the wool and silk industries in Britain, finished quilts such as this one were usually exported to America. It was legal to import fabrics into London, but you had to export them again. America was a fast-growing market, like China is today. People find it odd that a lot of the British fabrics celebrated the success of the American Revolution, yet the Brits were interested in the market. I’ve got several examples of the really plain, boring fabrics that were the mainstay of the early American textile industry. Today this industry barely exists in the U.S. because it’s gone overseas where the labor is cheaper. Why did it come here in the first place? Because labor was cheaper. Mechanization is so important to the story of American textile history. There weren’t as many people here as in Europe, so manufacturers needed to mechanize in order to increase output. Collectors Weekly: How did you choose the 40 quilts in the collection? Eaton: I chose them because of the letters associated with the Mary Remington quilt. You just never find that level of personal information. I know what this woman thought about her husband, I know they had marital problems really soon after they married, I know that there was some discussion of them divorcing. This was in 1816. Silk wholecloth quilt from the 1600s, maker and origin unknown. Gift of Henry Francis du Pont. When I read those letters and noticed the issues they raised, I started looking at the collection to see whether there were other quilts in the collection that would fit into those kinds of general themes. There are some really wonderful quilts that didn’t make it into the exhibition because they didn’t fit into those particular themes. Hopefully, I’ll be able to do another exhibition. For example, I’d love to do a smaller exhibition maybe on the backing fabrics on the backs of the quilts. That’s a story that I was unable to tell. Collectors Weekly: In the letters that you were reading, what themes jumped out at you? Eaton: The main ones related to how quilting fit into this one woman’s life. Mary Remington referred to her quilting as her work. And then there are themes like the American textile industries. She talks about visiting some of the earliest cotton-spinning mills that her family had invested in. At one point, she writes her future husband, who’s traveling, asking him to bring back a tippet, a kind of scarf or shawl, from Russia because she knows that he can get it much cheaper in Russia than she can buy it in America. So here’s somebody who lives in a tiny, little village in the back of the beyond, and she knows exactly what’s available in Russia. That’s not what you think of when you think of young girls in 1815. So the themes in the exhibition really came out of her letters. Collectors Weekly: When did quilts become known as works of art to be hung on walls rather than used as a bed coverings? Eaton: Many people say that change really started about 1971 after a very important quilt exhibition at the Whitney Museum in New York, but I can tell you that Henry Francis du Pont hung quilts on his wall as works of art in the 1920s and 1930s. And I feel very strongly that the practice of looking at quilts as art and thinking of them in an architectural-design context goes back to the 18th century, if not earlier. Today’s art quilts, which is a really rich, very interesting movement, are just part of this whole continuum over several centuries. Quilts were considered works of art in their own right much, much earlier than people think. I have a number of examples in the exhibition that were purposely made as gifts. I’ve got one that was made in 1860 out of mid-1700s wedding dress fabric. It was given to her granddaughter who was three years old in 1860. So a number of them are gifts. Some of them are utilitarian or were used as furnishing in a bedroom. Others were made for personal use. Collectors Weekly: Were all these quilts made by hand? Eaton: Yes. 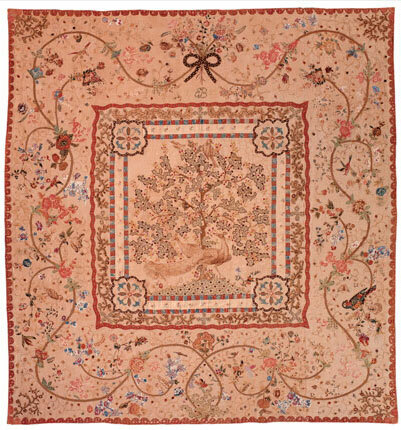 The most recent quilt in the exhibition was made in 1860, and its fabric is from the 18th century. Sewing machines were widely available in the late 1850s, early 1860s, but all of the quilts in the exhibition were made completely by hand. Some of the stitching is so fine. Raw sewing skills, which are what these quilts represent, were really highly developed back then. Today, people are just amazed at the quality of the regular, tiny, beautiful stitching. The sewing skills are just exquisite. Collectors Weekly: How long would it typically take to make a quilt by hand? Eaton: It all depends on how many hours a day or how many times a week you might spend working on it, so it really varies. I can document from Mary Remington’s letter that her whitework quilts took her about a year, almost exactly a year. She starts talking about one in January 1815 and has finished it by January 1816 when she got married. In one letter she actually says to this guy, a ship’s captain roaming around the world, “You may circumnavigate the globe before I finish this.” So it took her a year, I know that one for sure. I don’t have that level of information about almost all of the others. Sometimes women would work on things together; sometimes they would work on things individually. For Mary Remington, there’s never any reference that anybody helped her at all. Collectors Weekly: When women worked in a group, did everybody contribute their own creativity and ideas, or were they following instructions? Eaton: The part of quilt making that was usually done in a group was the actual quilting. Each woman would have had a quilting frame with the design drawn on. Cotton pieced Friendship quilt, maker unknown. Delaware, 1842-1844. Gift of Thomas Reed Clayton and family. There is this really wacky quilt in the exhibition that is made out of a printed fabric. It’s a whole-cloth quilt, so the design on it is just a print of all of the American presidents up to Andrew Jackson. The quilting is really kind of boring, just diagonal rows of stitching. They obviously started at either side of this thing because when they got to the center, they hadn’t planned right and the lines didn’t match up. So, instead of a quilt with straight diagonal lines, they go wobbly in the center. Quilters who see that quilt just laugh, probably because they can identify with it. Collectors Weekly: What are your favorite quilts in the collection? Eaton: Well, I love Mary Remington’s quilts because I know so much about her. In addition to the quilted coat of arms, there’s one with a really beautiful appliqué flowering tree that I think is just exquisite, and I love the gold one with the ship in the middle. If I had to choose, if the house was burning down or the museum was burning down, God help us, and I had to save one, I’d be really hard pressed. I would stand there and dither, probably. Collectors Weekly: How big are the quilts? Eaton: They vary in size. The sizes of the beds weren’t standardized back then. Wealthy people in the mid-19th century tended to have bigger beds, so some of the quilts are huge. But then the one from the 1600s was also pretty big. Some of them are 10 feet square, although many are rectangular. Others, like the semi-circle covers for demilune dressing tables, are very small. Collectors Weekly: Were the quilts you chose in good condition? Eaton: We’re very lucky. At Winterthur we’ve got an excellent textile-conservation lab. We also teach art conservation. We offer two graduate programs with the University of Delaware, one in American material culture and another in art conservation. So we’ve got a state-of-the-art conservation lab filled with very skillful people. For some of the quilts, our conservators were able to do some cleaning and structural stabilization to make the quilts strong enough to hang up on a wall. Some of them were in great condition, though, and didn’t need it. The condition of a quilt always depends on how people keep them over time. With proper care, they can survive for hundreds of years, but if you have a quilt on a bed and the kids jump up and down on it all the time, then it’s probably not going to last very long. In general, we chose quilts that were in good enough condition to show. Collectors Weekly: Do you have any preservation tips for collectors? Eaton: The first thing I would say is, don’t wash your quilt. Washing can hurt the dyes and finishes. You can end up with quilt soup; sometimes a quilt that has had a lot of light damage looks strong, but when you put it in water, it will just dissolve. Printing blocks and tools on a pieced quilt. Bequest of Henry Francis du Pont. Light, dust, dirt, and soiling are all things that can affect the long-term durability of a quilt. The less exposure to light and the more protected they are, the longer they’re going to last, but if you always keep them packed away in drawer, you’re obviously not going to enjoy them, so there’s a balance. You have to figure out where you fall along the preservation line. That said, I think people ought to take into account how rare and important their piece is. If it’s a kind of quilt that is a typical example and there are many others like it, you might feel like you can use it more than something that is very rare and unique to the history of quilting. I would hope that people would feel obliged to take extra care of that more unique and rare type of quilt. All antique quilts are important in different ways, and they’re important to different people in different ways, so it’s a very personal decision. Within the museum, our goal is to preserve them as long as we can, and that’s why we limit the amount of time they’re out. That’s why we’re going to take these quilts that are on display now in Milwaukee, and we’re going to put them away. We use our quilts to teach, we use them to do research, but we don’t have them out hanging on a wall all the time because they will deteriorate. We see our role as preserving things for the longer term. Collectors Weekly: Thank you, Linda, for speaking with us today about quilts and the Winterthur museum. “ ” The earliest known tarot decks weren’t designed with mysticism in mind; they were actually meant for playing a game similar to modern-day bridge.